get a cool and breezy drive around the lake in the bargain. mozzarella, drizzled everything with a fresh and tangy cilantro vinaigrette, and served it up with some grilled flour tortillas. 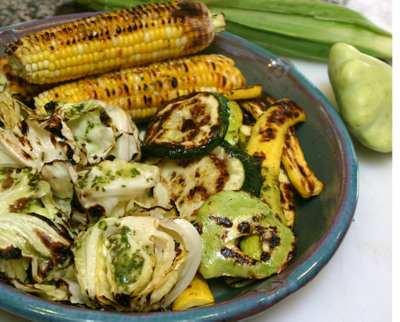 grill along with the cabbage and squash. It was so fresh and sweet that about 8 minutes was plenty. Sunday lunch on a hot summer’s day. Fresh grilled corn… how lovely! I ate plenty of these growing up. Freshly picked from the fields onto hot coals! Dave says I’ve basically got the vinaigrette right, but he toasts about a tablespoon of coriander seeds, grinds it up and adds it to the dressing. Nice layering of coriander flavors.